When Absorbine® redesigned their UltraShield® Fly Mask last year, they aimed to set a new standard in protection and comfort. The result was a combination of high-tech fabrics, improved fit, lightweight durability, and an 80% UV protection rating, raising the bar for what a fly mask should be. The new design only left customers desiring one additional feature: an extended nose option for the most complete coverage. Now, Absorbine® is proud to introduce their latest innovation in UltraShield® fly control: The UltraShield® Fly Mask with Removable Nose. The latest upgrade to the UltraShield® Fly Mask offers full-face protection from insects and the sun, extending coverage to the nose. The nose piece is firmly attached with sturdy Velcro® closure, but can easily be removed for washing. The extended nose option is particularly beneficial to horses with light colored noses, blocking 80% of harmful UV rays to protect sensitive skin. In addition to adding a removable nose, a number of upgrades were made to the UltraShield® Fly Mask to even further improve performance. The mask now features a wider Velcro® closure at the jowl to help keep the mask secure, a new angle to the eye darts to increase protection around the eyes, added coating to the mesh for enhanced durability, and reinforced double seams for even greater tear resistance. The UltraShield® Fly Mask with Removable Nose still features breathable, moisture-wicking fabrics for optimal comfort and fit, including a diamond knit around the crown and jowl used in running apparel, and a lightweight sport knit for the ears that’s commonly used in football jerseys. UV protection remains an optimal concern, and the reinforced mesh continues to offer an impressive 80% UV protection rating for coverage of the face and nose. 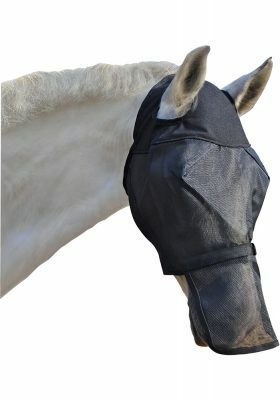 The UltraShield® Fly Mask with Removable Nose is available in horse size, with or without ears.